Prices drop - Grip N Rip Racing LLC. 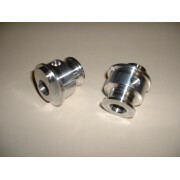 These billet aluminum wheel spacers are to replace the weak plastic outside rear axle wheel spacers. The plastic spacers between the rail and outside rear axle wheels are breaking in cold weather and hard riding. If the spacer breaks your axle loosens up and your stranded. Sold in Pairs Fits Crossfire and ZR models all years.